Description T7 Tag Peptide is a 11 amino acid peptide derived from the T7 major capsid protein . The T7 tag is an epitope tag composed of an 11-residue peptide encoded from the leader sequence of the T7 bacteriophage gene10. This gene encodes a T7 major capsid protein whose function is not clear. Epitope tags are useful for the labeling and detection of proteins using immunoblotting, immunoprecipitation, and immunostaining techniques. Because of their small size, they are unlikely to affect the tagged protein's biochemical properties. 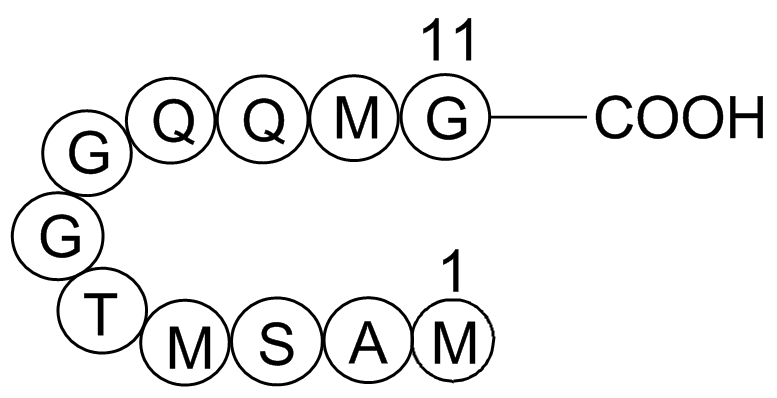 The T7 tag is commonly engineered onto the N- or C- terminus of a protein of interest so that the tagged protein can be analyzed and visualized using immunochemical methods. The T7 tag has been used extensively as a general epitope tag in many expression vectors including the pET system that is based on T7 RNA polymerase expression systems . 1. Studier, F.W. and Moffatt, B.A. (1986). Use of bacteriophage T7 RNA polymerase to direct selective high-level expression of cloned genes. J Mol Biol 189, 113-30.